All transactions are safe and secure with a reliable history in online purchasing behind each of our associates. Buy the I Love Jonas t-shirt to own Jonas Brothers clothing and merchandise. 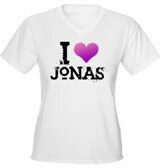 Whether you love Nick, Joe or Kevin, these I Love Jonas shirts will cover all three. Wear it to your next Jonas Brothers concert to let the band know that you're their number one fan. Their latest CD, Lines, Vines and Trying Times, has become their second number one album to date, featuring the hit singles "Paranoid", "Fly With Me" and "Send It On". These Jonas Brothers t-shirts will help show your love. In addition to the I Love Jonas tee above, browse the Jonas Brothers Clothing Gallery for more apparel like men's and women's clothes, kids shirts or hoodies.